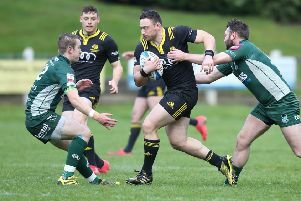 A generous helping of Melrose influence, plus a dash of Hawick, is in the mixture being served up by Scotland Club XV – and Melrose – rugby head coach Rob Chrystie for the Dalriada Cup second-leg fixture against Ireland in Dublin tomorrow (Friday). The Scots have been handed a boost as Scotland Sevens internationalist, Craig Jackson, of Melrose, has recovered from injury and will start. Greenyards back Patrick Anderson will also take his place in the starting XV, along with clubmate Murdo McAndrew and Hawick captain Shawn Muir. Another Melrose player, Conor Young, will be on the bench. Scotland need to turn around a 14-point deficit to retain the silverware, following a 9-23 beating at Gala’s home ground of Netherdale last Friday. The Dalriada Cup is won by the team with the higher aggregate score over the two matches. Ahead of the team’s departure to Dublin, Chrystie said: “We know this weekend’s going to be a huge challenge but the squad is really looking forward to getting out there. “We know we’re chasing things a little bit after the first leg but we trained well on Monday night and it’s important to make the most of these sessions when we get the opportunity. Scotland Club XV: Craig Gossman (Boroughmuir); Patrick Anderson (Melrose), Craig Jackson (Melrose), Robbie Nelson (Currie Chieftains), Kyle Rowe (Ayr); Gregor Hunter (Currie Chieftains), Murdo McAndrew (Melrose); Peter McCallum (Captain) (Ayr), Iain Wilson (Heriot’s), Jason Hill (Heriot’s), Blair Macpherson (Ayr), Hamilton Burr (Stirling), Steven Longwell (Ayr), Ross Graham (Watsonians), Shawn Muir (Hawick). Substitutes: Michael Liness (Heriot’s), Conor Young (Melrose), Lewis Skinner (Glasgow Hawks), Ruairidh Leishman (Heriot’s), Jack McClean (Heriot’s), Kaleem Barreto (Glasgow Hawks), Paddy Dewhirst (Ayr), Jamie Forbes (Currie Chieftains).